Politics is an integral part of Democracy. And as such, political parties with radically different outlooks towards running the country is only to be expected. Difference in opinion is unavoidable and even welcome to find the most efficient manner in tackling the problem. However, all political parties must agree on some essential points if a democratic government has to succeed in its purpose. Firstly, the political parties must accept the mandate of the people. Whatever the results of elections, the parties must accept it and plan their future accordingly. Secondly, the security and pride of the nation is above all else. They should not indulge in any activity which might compromise the security and pride of the nation. Thirdly, in the Parliament, the parties must put their rivalries and personal interests aside and work together for the betterment of the people. So far, the Indian National Congress had violated only the first and the third points. They have refused to accept the mandate of the people which reduced them to less than 45 seats and they have completely rejected Narendra Modi as the Prime Minister of this nation. They refused to cooperate with the present government and completely wasted the Monsoon session of the Parliament. But now, with Mani Shankar Aiyar and Salman Khurshid, they have crossed all limits. Our dear Mani Shankar Aiyar walked into Pakistan and stated on a TV channel, “Agar aap Varta Chahtey hain, to Narendra Modi ko hataiye, humay ley aaiye.” That is, “If you want dialogue with India, get rid of Narendra Modi and bring us into power.” There are a thousand ways on how this statement could be interpreted as but the most obvious question is, how does Mr. Aiyar think Pakistan will help them get into Power in India? Because as far as I know, Pakistanis do not get to vote in Indian Elections. Then what did he mean when he said Pakistan should get rid of Narendra Modi? An obvious conclusion is, Mr. Mani Shankar Aiyar wants Pakistan to sponsor more terror against India on purpose so that the relationship between the two countries worsen further and the Congress can put the entire blame on BJP for spoiling an already troubled relationship with Pakistan. Perhaps, Mr. Mani Shankar Aiyar ‘s intentions were far more sinister. In all probability, if he could make such dastardly comments on Pakistani Media, he’s quite possibly making far more sinister remarks to the Pakistani authorities during a private conversation. Perhaps he wants Narendra Modi to be assassinated? How else could Pakistan get rid of the Indian Prime Minister within his Five Year Term? What I am trying to say is the comment might be far more sinister than what appears to the naked eye. And there’s only one man who can answer what Mr. Aiyar meant when he said those words. And that is the man himself. 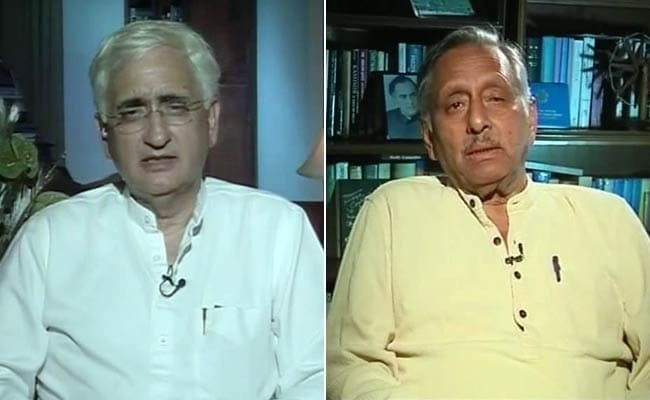 Mani Shankar Aiyar should be charged immediately with Treason and his remarks be treated as an act of Sedition. Astonishingly however, Mani Shankar Aiyar is not the only prominent member of the Congress who has been making such nefarious anti-government remarks on foreign grounds, especially in a country which is an enemy of the State. Salman Khurshid went one step further and claimed it was Pakistan which was vying for peace and it was India which was not reciprocating their emotions. What Treachery! According to Mr. Khurshid, “India has not responded to Pakistan’s overtures for peace in South Asia the way it should have.” This is a horrendous remark, highly disrespectful of our armed services and disgustingly hurtful statement to make for all the Indians who have lost their lives due to Pakistan sponsored State Terrorism. Has Salman Khurshid forgotten all the people who lost their lives in the Mumbai attacks? That was 7 years back. And very recently, another terrorist was caught by villagers in Kashmir who admitted to being a citizen of Pakistan. Is that how one pursues peace, Mr. Khurshid? By endorsing Terrorism as State Policy? It’s insulting as an Indian that we had people like these ruled over us for decades. Do they not realize they compromise India’s stand against Terrorism? When Prime Minister Modi talks internationally of isolating those who harbor and sponsor terrorism, we have the likes of Mani Shankar Aiyar and Salman Khurshid sympathizing with an Enemy State. How low will these people stoop to defame Narendra Modi’s image? Do they not realize when they defame the Prime Minister of India in an enemy state, they defame 1.26 billion Indians also? And then they have the audacity to complain when they’re branded anti-nationals by the Right Wing. Well, if you are being labelled as Anti Nationals, it is because you have given us plenty of reasons to call you so. To top it off, the Indian National Congress hasn’t come out strongly against either of its members for spewing such depraved comments on foreign soil. Do we take it for granted then that it’s the official line of the party? And if indeed that is the case, then is there any future for us Indians under this corrupt party where we can successfully deal with Pakistan which sponsors Terrorism? Also, the silence of the Media on these Anti national comments is deafening. The Media which latches on to comments by the likes of Yogi Adityanath and Sadhvi Prachi chooses to ignore prominent individuals as Mani Shankar Aiyar and Salman Khurshid. Why these double standards? It’s more than obvious that the Congress Party and the Media has teamed up with the enemy to pull down the Modi government. And the only thing to look forward to is how the BJP and the Indians react to such Anti national elements trying desperately to get back into power.